Two weekends, one post | Turning my world upside down! Last week, I wrote about my daughter’s upcoming birthday and our plans. We ended up going for a lovely brunch in Wakefield, Quebec at a restaurant called Le Pot au Feu. 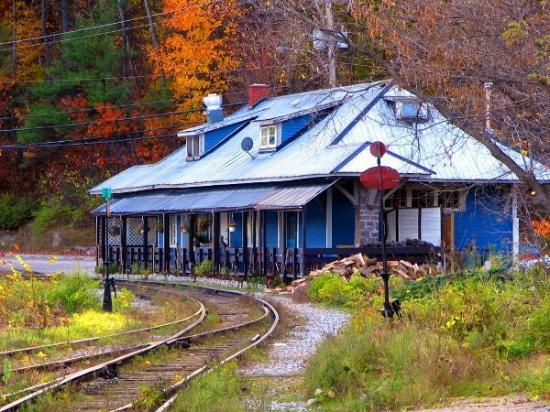 Situated along the river, right beside the old railway tracks, the restaurant is actually the old rail station. In the summer, an old steam engine runs on the track so that tourists can experience a time long past. We sat on the waterfront porch and enjoyed the breakfast buffet with the usual eggs, sausage, croissants and a very nice selection of salads (the chickpea salad was just a bit of fresh mint with a very light oil and some salt, yum!). Ariane decided on eggs benedict with smoked salmon and a cheese sauce. She also had a very rich piece of chocolate cheesecake which we shared. We took a brief drive around Ottawa looking for tulips, but it was a bit too soon for them to bloom, considering the long winter we’ve had. But the sun was warm, so we decided to continue our party on the patio and waited for Earl to come home from work to join us for cake and presents. Earl bought her a lovely silver pendant and I waited till the fuss was over and the candles were out to run upstairs and get her real present from me, which was a Nexus 7 tablet. Ariane was really surprised and loved her gifts! The week was busy for me. I gave a major test in one class and I’ll have to spend a good part of Sunday marking it. On Wednesday, Ariane, Earl and I went to an unusual puppet show. The show is part of a work done by a Masters of Fine Arts student Ariane knows. I’ve seen her perform in plays Ariane has been involved in this past year. The puppet show was quite unexpected as it uses objects like cups and teapots to tell the story of the Iliad, yes, Homer’s Iliad. So the show is storytelling, objects being used as characters and the faces of the puppet-masters, acting out the roles using outrageous and comical dialogue. The show was held in a quaint venue called Café Show, a café with a small stage area. It was a really enjoyable night. The next day, I had my performance appraisal. I was well prepared, had a great activity planned for the students and was just whizzing along when the fire alarm went off! Out we went and the appraisal was forgotten. In the end, the VP didn’t come back to class when we returned but she explained to me the next day that they had caught the 2 young students who’d pulled the fire alarm. Here I thought it was just a planned drill. Talk about saved by the bell. I haven’t received my evaluation yet. I suppose it will be ready for me to review and sign soon enough. Friday was the beginning of our Ottawa Conference for the exchange teachers (CLEE). We had about 20 teachers coming mostly from the Toronto area to tour Ottawa and take in some of our local sights and events. I only went to two events – a BBQ dinner at one of the local exchangee’s, complete with a bonfire and a lovely sunset on the river. And then this evening, another dinner, this one at Tucker’s on the Market, a comfy restaurant made for large groups, that serves a varied buffet. Both evenings were lovely. Most of the exchange teachers are from Australia, again this year, so there is always lots to talk about. And the conversation invariably turns to travel and what people are planning for their summer trips. Many will be going east to the Maritimes, like us, and some will travel west to BC and even Alaska, and other, even more ambitious, plan to travel East then West or vice versa! Looking at the picture, it reminds me of a campfire we had in Healesville, in the Yarra Valley. Sheryl was our hosted that weekend. She had a fabulous house! Anyway, she lit a fire that evening and it was so smoky, we could barely breathe out there. It didn’t dampen our spirits. But as I recall, I didn’t get any good pictures of that particular events. Jo, pictured left, is from Healesville as well. Maybe one day we’ll get back to visit. You are welcome to visit Healesville again anytime. There is always a place for ITA exchange teachers to stay on a visit. Thanks Sheryl! We are still marvelling at your gorgeous home. Hope we can meet again. And our door is open to you as well, even if it’s no longer in Langley. Visited Ottawa yet? This message, including any attachments, is privileged and intended only for the person(s) named above. This material may contain confidential or personal information which may be subject to the provisions of the Personal Information and Protection and Electronics Documents Act. ( PIEPEDA). any other distribution, copying or disclosure is strictly prohibited. If you are not the intended recipient or have received this message in error, please notify us immediately and permanently delete the original transmission from us without making a copy. Thanks Kim! I’m really happy with the way the pictures are displaying now. The conference is not one in the traditional sense. It’s more an opportunity for exchange teachers to visit Ottawa. However, they did get to visit 2 local schools. I had to work, so I wasn’t able to join them for that part. Nice post: Such is the life of a teacher 🙂 – I remember it well! I enjoyed going to conferences, too – such a great way to meet others. Wishing you a bonne evaluation!